Distant view of Seringapatam from Meadow's redoubt. bl.uk > Online Gallery Home	> Online exhibitions	> Asia, Pacific and Africa Collections	> Distant view of Seringapatam from Meadow's redoubt. 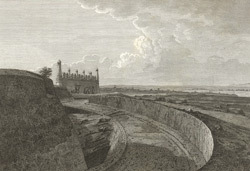 Etching with line-engraving of a distant view of Seringapatam from Meadow's redoubt by James Fittler (1758-1835) after sketches Robert Home (1752-1834) had made when he had accompanied the troops in Lord Cornwallis's campaign against Tipu Sultan in 1792. Plate 27 from Robert Home's 'Select Views in Mysore, the country of Tippoo Sultan' published in London in 1794. Seringapatam, situated close to Mysore, is an island fortress surrounded Kaveri River. The name of the town is thought to derive from the 9th century Hindu temple on the island, Sri Ranganatha. In the late 18th century, the Mysore rulers Haidar Ali (r.1761-1782) and his son Tipu Sultan (r.1782-1799) fought numerous wars against the British over the control of Southern India. Seringapatam was the site of the two most famous sieges in this conflict in 1792 and 1799. This redoubt or military outwork is named after Major-General Medows, who led the right division in the British attack on Seringapatam in 1972.